You may want to edit a resource that you have saved as a draft or a resource that has just recently been updated on your organization’s website. Click the tab for the section of Clicklaw where the resource you wish to edit was originally published or saved as a draft. You will see a list of all your organization’s resources in that section. To edit your resource, click View/Edit. Click the Edit resource tab to make changes to the resource entry. For details on how to work through the form, see Adding a new resource. Once you have made your desired changes, click Publish to make the changes visible on the public Clicklaw site, or click Cancel to start over. 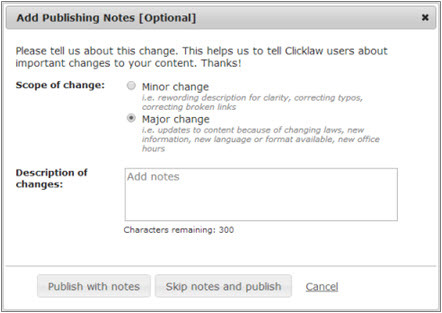 After clicking Publish, you will see a dialogue box asking you to send notes to Clicklaw Editors. Please select the type of change (minor or major), write the notes, and click Publish. Describe the changes that your audience will find useful, because the Clicklaw Editors may write about it on the Clicklaw Blog. If you would like to start over, click Cancel to return to the editing form. You can preview your changes at any time before saving or publishing them by clicking the Preview resource tab. After you click Publish, the changes can take up to 15 minutes to appear on the website. This page was last edited on 27 August 2014, at 11:13.